I’ve been doing a lot of research lately on what types of blog posts to write and one of the things I love to read is advice from authors. Now, I realise my debut novel isn’t out until September and I’m by no means an expert, but having begun to go through the process of revisions and edits, I’ve been learning a lot about writing contemporary romance and I thought I’d share some of those things with you just in case they’re of use! I’m quite organised by nature and that naturally lends me more towards plotting than pantsing. I need to know where I’m going from the beginning but even then, it’s easy to get lost! I’m now using the approach of mapping everything and I mean EVERYTHING! I map out the plot, noting each plot point I want to hit, I map out character arcs so I know where exactly that character is emotionally at any given time, and I even map out setting and atmosphere so I know when I want to up the tension in this way too! Some may think it excessive but it works for me. If you’re a panster you probably won’t want to work in this way but I would definitely suggest having some sort of plan so you know where you want to go and an idea of how you’re going to get there. How does this tip work for contemporary romance? Having plotted out mysteries, where you need to plant clues, foreshadow, and give the reader red herrings, contemporary romance isn’t that different. You’ll need to hint at feelings or events so they don’t come out of the blue and end up unbelievable. You need to build a romance story in a similar way too and that’s why some sort of plotting is important. This was one of my biggest learnings during the beta reading process. One of my beta’s made the point that some of the minor characters felt like they were only there for the protagonist. This was so true and it was a real ‘duh’ moment for me. If that was how a beta reader felt, it was obvious she wouldn’t be the only one feeling like that! Each character needs to be well rounded with a past, present, aspirations for the future, and strengths and weaknesses. I went back and looked at each character and made sure they changed through the novel and had much more depth. Even minor characters need major personalities! As in other genres characters in contemporary romance aren’t two dimensional. They need to have full personalities so their actions ring true. Readers of a particular genre are savvy and they know when a writer hasn’t done a good job. Each chapter needs to significantly move the story forward. I’ve read this a million times and I convinced myself that I understood it and that each chapter in my novel did move the story on, if not with action, then at least emotionally. The trouble is, it didn’t. I’ve learnt so much as a writer and I have a much better idea now of how to move the story forward with real action. Each scene, each chapter really needs to accomplish something by increasing the stakes and upping the tension. Some people might think contemporary romance is a slow-burner type genre but that is definitely not true! If anything, pacing is even more important. In commercial fiction a readers time is precious and there’s a lot of competition so if they’re not enjoying your book they’ll easily put it down and pick up another one. They’ve probably got a pile of to-be-read books loaded on their Kindles, or by their beds. You don’t want to be the one they put down out of boredom so make sure that every chapter, every page, every line, does something! 4. Be mean. Be really, really mean! A plot that doesn’t pose challenges and problems for its protagonist is boring. As a writer we have control of our characters and our job is to make life hard for them. A character with an easy life is a boring character. Your job as a writer is to sit there and think, ‘What’s the worst thing that can happen to this character at this point in time?’ and make it happen! So when I say be mean, I really, really mean it! Boy meets girl, they fall in love, nothing goes wrong, they get married, have kids, and oh look, they’re old and grey sat on the porch together. BORING! And, life isn’t like that! Romance readers want people to struggle and make life hard for themselves. They want love triangles, tension and strife. As a contemporary romance writer it’s your job to give it to them! This one is a little more generic but worth stating anyway. I love reading omniscient point of view narratives. It’s one of my favourites. I particularly love golden age crime and this is generally written in omni. For those that don’t know omniscient is an all knowing narrator who knows every characters thoughts and feelings. I tried it and…I was terrible at it! I can see why people warn you about head hopping. Even when you think you’re doing omni well, your possibly not (or I wasn’t anyway). It’s definitely worth challenging yourself to master different pov’s but I’d suggest trying some smaller practice pieces before attempting a novel that you intend to submit to publishers! Having said that, once you’ve found the pov you enjoy (and understand) writing in, then go to it! So, there you go. 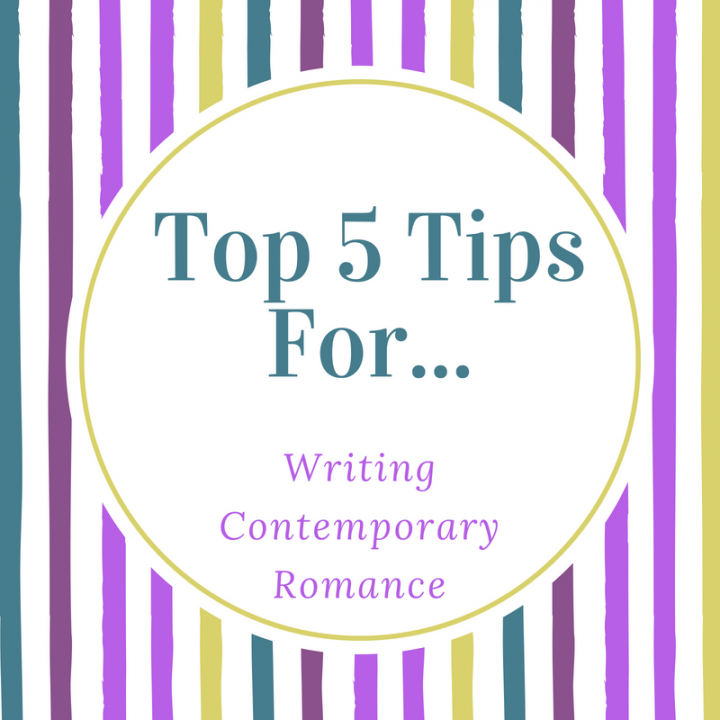 These are my top five tips for writing contemporary romance. I hope you find them useful and enjoyed reading. If you’ve got any hints or tips to share, I’d love to hear from you!